Hi all, the Fool card means the same to me. New beginnings and stepping off blindly!! My big Fool card moment in my life was when I left the Catholic church for Wicca. I grew up C and I really felt that I was stepping off the cliff into the unknown!! I have never regreted it though!! Oh my gosh, I LOVE the Wonderland Tarot! The anime style artwork gets me every time. May I ask where you got it? I've found pictures of it online, and they just bring me back to junior high, when my brother first introduced me to anime by way of Sailor Moon. I think I need to have it for that reason alone! Hehehe. Thanks, Scamphill. Unfortunately, with the shipping costs, it puts it over my Tarot budget for this month (which I have, sadly, already broken lol). I do have my eye on the Manga Tarot from Lo Scarabeo: http://www.aeclectic.net/tarot/cards/manga-minetti/. I'm thinking that might be my next deck, lol. 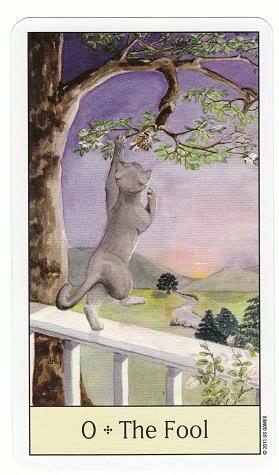 I forgot to tell you how much I love that card from the Cat's Eye tarot. It is so accurate. Kittens have no fear and go ahead and jump right in to what they want to do. I love it!!! The fool is about new beginnings, a start of a new cycle - a journey. It gives me a feeling of finally making a risk to reach for your goals and dreams. But everything is not always about risk alone, you need to take precaution and don't just jump into one situation immediately... take your time to make sure you grab the opportunity and not let it slip unto your hands because of carelessness of rushing to achieve your own desires. Sadly, this is true. I've been getting my decks from Amazon--I have an Amazon Prime membership so I get free two-day shipping (on top of the discounted cost one usually finds on Amazon). Which has spoiled me rotten and made me not want to pay shipping (or full price, really) anywhere else! LOL. 2. or I should have faith and take the risk. Hi. Speaking of spending too much!! I ordered another Celtic deck today!!! me bad!! A lot of Fool cards prominently feature a path, and I notice the Cat's Eye card has a path in the middle distance, leading toward the mountains. Robin wood always says mountains represent enlightenment, which I believe is the goal of the Fool. I see a sunrise between the distant peaks, a new day dawning, beginnings indeed. That the tree is in flower indicates springtime, another indication of new beginnings.